Apple is building a new data centre in Denmark, and it has some interesting ideas on how to power the data center with renewable energy, while also giving back to the community. According to a new report from Macworld, excess heat generated by a new Apple data center in Denmark will be captured and returned to the local district’s heating system, which will warm up homes in the community. Running a server farm or a data centre is no small feat and the amount of heat that such places can generate is immense, which is why they are usually stored in rooms that are very, very cold. However in order to not waste the heat that has been generated, Apple’s data centers in Denmark will actually be returning excess heat back to the community. The center will “capture excess heat from its equipment and conduct it into the local district heating system,” Apple explained in its 2017 Environmental Responsibility Report. 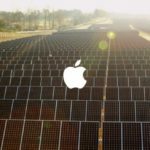 Apple in turn will receive some power from the landscape —in a system designed with help from Aarhus University, agricultural waste will be converted into methane used to generate energy, with a fertilizer byproduct going to local farmers. The digester reaction turns some of the waste into nutrient-rich fertilizer, which Apple returns to local farmers to use on their fields. It’s a “mutually beneficial relationship,” Apple said in its environment report, released this week. All of this is part of Apple’s green efforts in which the company had recently pledged to work towards a future where all their products will be made from recycled materials, and that they aim to stop mining the earth.